Expert: "Obesity is still the leading nutritional health problem facing Americans and the leading driver of health-care costs. Stopping it from going up is a nice start, but more is needed." (Health.com) -- Obesity rates in the United States are still sky-high, but for the moment they appear to have stopped climbing higher, according to new data released by the Centers for Disease Control and Prevention. One out of every three American adults is obese, and two out of every three are overweight, according to the data. Among children and teens, the numbers aren't much better: Roughly 17 percent of children between the ages of 2 and 19 are considered obese. All of these percentages have increased sharply since 1980, the data show. The obesity rate among women and children hasn't changed measurably over the past decade, however, and it has remained largely flat among men for the past five years, according to the CDC report, which was published in the Journal of the American Medical Association. Obesity experts reacted positively to the report, but emphasized that there was little to celebrate about the big picture. The obesity rates have somewhat leveled off, and for the most part that's good, but the bad news is that they have leveled off at a prevalence rate that is alarmingly high. "The obesity rates have somewhat leveled off, and for the most part that's good, but the bad news is that they have leveled off at a prevalence rate that is alarmingly high," says Scott Kahan, M.D., the co-director of the George Washington University Weight Management Program, in Washington, D.C. "We have a lot of work to do, and this has to be a national priority to move forward from here." Louis J. Aronne, M.D., the director of the Comprehensive Weight Control Program at New York-Presbyterian Hospital/Weill Cornell Medical Center, says that "it's premature to declare victory in our war against obesity, but this is the first battle that has been won." He adds, "Obesity is still the leading nutritional health problem facing Americans and the leading driver of health-care costs. Stopping it from going up is a nice start, but more is needed." It's not exactly clear what's responsible for the stabilization of the nation's waistlines. Experts say that the trend may be due to greater public awareness about healthy diets and the importance of regular exercise, and to the various school- and community-based programs that have been launched to fight the obesity epidemic. The growing popularity of gastric bypass surgery may also have played a role, according to Aronne. "It could be that we're finally having an impact on people's behavior, and starting to take enough aggressive action with weight-loss surgery to stem the tide of obesity," he says. The data in the CDC report were based on height and weight measurements collected during a biannual national survey of more than 5,500 adults and 4,000 teens, children, and infants. Those measurements were then used to estimate the average body mass index (BMI) of various segments of the population. Obesity is defined as a BMI of 30 or above, and overweight is defined as a BMI of 25 or above. 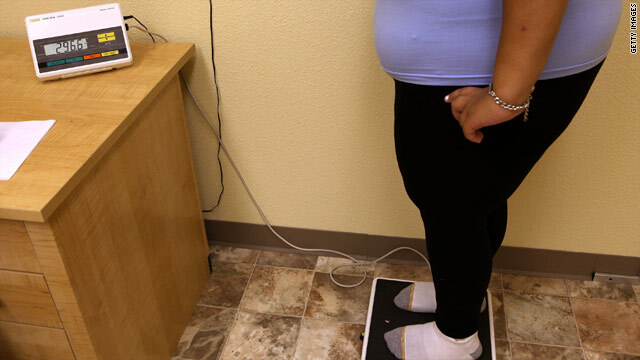 Some groups are at greater risk for obesity than others, the survey showed. The prevalence of obesity among women (36 percent) was slightly higher than that among men (32 percent), and it was also higher among blacks (44 percent) and Hispanics (38 percent) than among whites (33 percent). The researchers caution, however, that these group differences in BMI may not present an accurate picture of obesity, since people of different ethnic groups tend to carry their weight differently and have different ratios of fat to lean tissue. Excess weight has been implicated in more than 60 diseases, included heart disease, diabetes, and breast cancer, according to Aronne, who stresses that lowering the obesity rates must remain a national priority. "Obesity has to remain at the top of the list of problems we need to manage to improve the health of Americans and control health care costs," he says. The CDC researchers caution that obesity trends are difficult to forecast, and that while rates may have stabilized somewhat, "future large changes cannot be ruled out." Listing calorie counts and other nutritional information on menus, using taxes on junk food and soda to fund obesity programs or subsidize fruit and vegetable prices, and re-establishing physical education in the nation's schools are "all part of the solution," says Kahan. Health.com: Is the fat acceptance movement bad for our health? "Obesity is now a part of the national dialogue," he adds. "If we continue with our social and political will, we very well might see continued progress."